Making up yarn pom poms has never been so easy now you have some fabulous and easy plastic tools to use which make your job much easier. These very clever implements are made by the company Clover who design lots of cool products mainly for yarn crafters and those who knit and crochet. 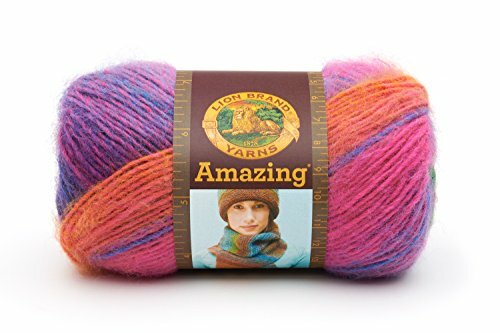 I've been using these brilliant tools for a little while now and am getting quite addicted to making up these sweet fluffy balls of yarn which are ideal to jazz up and decorate cushions, throws, pillows, banners, clothing and more. Come and see how to use this wonderful set of devices so you can have fun creating them too. With the following set of detailed photo instructions, you'll discover just how easy it is to make up a quick batch of lovely fluffy pom pom balls of yarn with these very clever and ingenious range of devices. Clover have come up trumps again with yet another set of products which soon become indispensable tools for avid crafters. If you are used to the old method of winding yarn through a piece of cut card, take heart! These devices are much more user friendly and are made from strong plastic so are ready to use whenever you need them. It can be very quick to make each ball - my regular sized ones take around 3 minutes from start to finish. The great thing is that you can use them with odds and ends of yarns and wools that you don't want or are too small to knit or crochet with. Step 1: Put your maker out in front of you on your work surface - I use the 2.5 Inch Diameter Green One which comes in the large pack. This one is my favorite size. The outer green parts are all 'arms' which pull out. You want to pull out a pair of these 'arms' on just one side of your device. Since I am right handed, I prefer to pull out the 'arms' on the right side for winding. Step 2: Once you've pulled these arms out, you need to line them up together as I've done in the second photo above. Now you need to start wrapping your yarn from one end of the 'arms' - and it makes no difference which end you start at, by the way. Don't knot the yarn around before you wrap, just hold the end of it with your thumb and wrap around the end until it is covered over and secured in place. Step 3: What you are aiming for is to cover the whole of this plastic section with yarn and you definitely don't want to see any parts of the plastic peeking through. There is little danger of over-wrapping since, if you add too much yarn, you won't be able to push the movable 'arm' section back into place - so that's an indicator that you have added too much. However, a common newbie mistake is not to add on enough which will end up with a really limp and rather pathetic looking finished product. Step 4: My process is to wrap a little and then push the wrapped strands back towards the side I started wrapping from which makes a tighter and denser wrap and a firmer pom at the end. You need to completely cover the 'arm' with a nice thick layer and this could mean going back and forth across this section several times depending on how thick or thin your fiber is. Step 5: Keep wrapping on this side until it feels quite thick. You should be able to push the 'arms' back into the middle of the circle - if you can't it means that you've added too much and you'll need to unwrap a bit of yarn. Look at the first photo above so you can see where to place the yarn next - you want it through the middle so you can start winding it onto the next pair of 'arms' in order to finish your pom pom. Step 6: Now you need to pull out the other pair of 'arms' and start wrapping on this side. Make sure this pair are level before you start to wind around. Step 7: Wrap this pair of 'arms' just in the same way as you did with the first pair. You want to aim to get roughly the same thickness too which is easier to judge when you push the maker back into a circle shape. Once you have finished winding, push the 'arms' back down again. Step 8: Now it's all closed back up again, you can snip the end of the yarn or wool off since it won't unravel while closed up. You'll need a pair of really sharp and small scissors (such as embroidery scissors) to insert and snip around the middle with. Pop the bottom blade of the scissors where shown in the photo above and start cutting all around the center. Step 9: For me, the cutting is the really fun part. I just love cutting through and freeing the ends of the fibres - snip, snip! When you start cutting around, you'll notice that there are groves around the middle to aid your scissors to cut in the right place. Even my young daughter is able to do this so they made it easy to cut in exactly the right place. Step 10: Cut all the way around but the one thing you MUST NOT DO at this point is to open out the arms. The closed arms with the maker in the circle position keeps all the yarn safely secure. If you open or loosen these right now then you'd end up with a mess of cut fibers instead of a lovely, fluffy yarn ball. Step 11: At this point, you will secure your wrapped pom so it is unable to unravel. You do this by cutting off a length of yarn and placing it around the grooves in the middle of the maker where your scissors just cut around. Tie it at the top with a single loop knot (the same way you tie laces - but single rather than double) and pull to tighten this simple knot so the yarn goes between the middle groves and tightens around the bulk of woven fibers. Then make another loop knot to fasten off. Snip off any loose ends. Step 12: Now it is all secure, you can open up all the 'arms' on your device. Spread them all out as shown in the photo above. Step 13: Ignore the arm sections now and focus on the middle circle sections. You need to get hold of each side of these circles and pull outwards to pull apart your Clover device and release the finished pom pom. You can then pop the device back together, first pushing in the middles together. Once you've done this a few times it becomes very easy to remember what to do. Step 14: To tidy up my finished piece, I like to just gently roll it between my hands which helps to fluff it up and also removes any stray pieces. I don't tend to snip it further but some people like to snip their poms right down into a tight ball. The choice is yours! I hope you've enjoyed reading my wizzles page today, thanks for your visit. Enjoy making plenty of these for all your textile crafts! 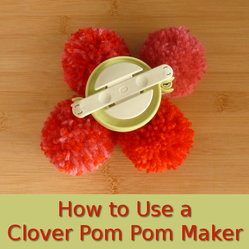 Make lots of fluffy pom poms with the Clover maker in no time at all! You're so welcome. Yes I totally agree that the Clover pom pom maker package isn't helpful with instructions. 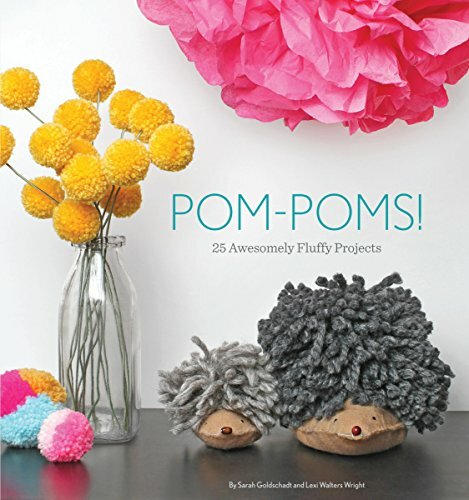 Enjoy making your pom poms. Can't thank you enough for the great photos and directions! Just made my first one and it's perfect! Directions on the package are pretty worthless. Just made it - thanks for the tutorial we lost our instructions - yay!!! Yes, I believe these are made by a Japanese company. Great gadgets - not great instructions for those who read English! Thanks, Mandy. Thanks! The directions on mine are in Japanese. I was never good at knitting but this looks like fun. Never thought making pom poms with wool could be so artistic.